Be prepared to have endless hours of fun with this fantastic colorful reversible two-toned sequin rose gold mermaid throw Pillow! 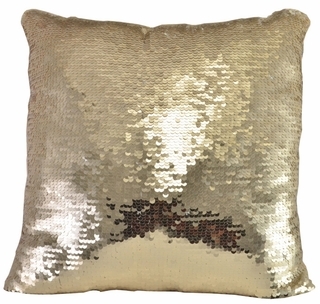 One side of this awesome accent pillow is a plush beige velour and the other side is covered in reversible sequins which are rose gold on one side and beige on the other. The sequins are easily flipped back and forth to write or draw whatever you like, making it lots of fun to redesign your pillow patterns or leave messages for your love ones. This is a groovy square accent pillow that is 12 inches by 12 inches.